pet food discussion back to basecamp. The authors begin by prefacing the study with other research studies – namely “Evaluation of recipes for home-prepared diets for dogs and cats with chronic kidney disease” by Larsen et al., and “Evaluation of recipes of home-prepared maintenance diets from dogs” by Stockman et al. Larsen’s study found that calcium, phosphorus and vitamin D in many homemade pet food diets did not meet the standards set forth by the National Research Council (NRC) and Association of American Feed Control Officials (AAFCO). Stockman’s study evaluated recipes found in books and online that were not written by a certified veterinary nutritionist or nutritionist with a PhD. Their study found that 95% of the recipes were deficient in at least one nutrient. Several integrative veterinarians including myself are advocates for homemade diets since you can control the ingredients, provide the best, optimum nutrition for your companion pet’s health needs, and can use the freshest ingredients possible. However, we generally agree with the findings discussed above. Indeed, many of us want and encourage pet caregivers to work with certified nutritionists who can formulate the appropriate diets. Reid’s team hypothesized that calcium, phosphorus and vitamin D in foods would not be significantly different across four databases: United States Department of Agriculture Food Composition Database, Canadian Nutrient File, AUSNUT 2001-13 Food Nutrient Database, and French Food Composition Database. They did offer the caveat that nutrient content has been known to vary between ingredient databases from country to country. There are several reasons for this variation such as fortification, laboratory analysis, how food is grown and harvested, and analytical techniques. The team did identify potential shortcomings and compensated such as ensuring that ingredients were not fortified with vitamin D.
To test the hypothesis, foods were included that were common in online pet food recipes, but the recipes were not necessarily formulated by an animal nutritionist to meet AAFCO guidelines. Ingredients were sorted into five categories: meat (animal product), fruits/vegetables, grains, dairy and fat. The team started off with 114 foods, but they eliminated some and also noted that only 47 covered all of the food categories. in calcium, phosphorus, and vitamin D concentrations of similar foods among the databases. 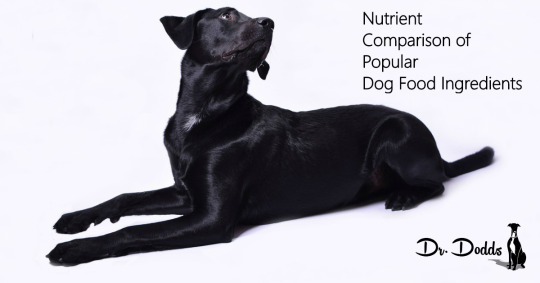 Thus, the database used for nutrient content of commonly used foods in homemade pet food diets should not affect total diet nutrient density predictions of calcium, phosphorus and vitamin D.
To reiterate, this study is provided a nutrient comparison between four databases. The results do not reflect whether the foods analyzed met NRC or AAFCO standards for pet nutrition. Many factors need to be accounted for when formulating any pet diet including bioavailability, food sensitivities, nutrients, etc. So, please consult with an experienced pet nutritionist before cooking for your pets.